Maine Mendoza who also popularly known as 'Yaya Dub' of Eat Bulaga's Juan for All, All for Juan segment answers why she was fainted during the show of Kalye Serye. Yaya Dub explained everything using his official Twitter account. She posted a screengrab photo of her statement. It was stated that she forgot to drink her medicine because even before the segment of Kalye Serye, she was already not feeling well. It says, "Alive and still kicking! As I have posted earlier, I'm feeling under the weather since this morning. We're too busy preparing for the segment that I forgot to take my meds." She think that it might be the reason why she passed out during the show on Eat Bulaga. Netizens might think that it was included to the script of Kalye Seryer but Yaya Dub denied it. She said, "None of it was scripted. I was immediately rushed to the hospital so I can have myself checked." 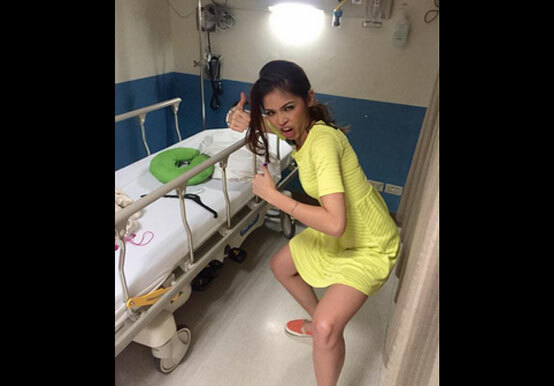 Yaya Dub added, "Nothing to worry, they said it's all because of over fatigue." Maine Mendoza thanks all of her supporters and fans who give concern on her condition a while ago. She said, "Super appreciate all the love and concern from everyone! Rampa na ulit si Yaya Dub!" Comments or suggestions about "Yaya Dub answers why she faints on Kalye Serye of Eat Bulaga" is important to us, you may share it by using the comment box below.